Palazzo Pitti is one of the five most important sights in Florence. The Renaissance palace is the only major attraction on the other side of the Arno River in the Oltrarno district. Today the Renaissance Palace houses some very important museums. In dozens of rooms you can admire the magnificent interior and many works of art. Those who visit Florence should definitely go to Palazzo Pitti. At the end of 2018 we paid 13 Euro for all rooms, museums and special exhibitions mentioned below. This is not little, but you get to see a lot. The entrance fee includes the following in the palace: Galleria Palatina, Appartmenti Royali (Royal Apartments), Galleria d arte moderna (19th century Art Gallery), Museum della Moda e del Costume (Fashion Museum and Costume Museum) and Museo degli Argenti (Silver Museum). We recommend a guided tour of the palace. The big sights in the palace Pitti are clearly more interesting with explanation by a guide. A very good guided tour through the Palazzo in English can be booked on this website. The opening hours of the palace in Florence depend on the season. Royal living spaces: Here you can see the former luxury life of the rich inhabitants in estimated more than 25 rooms. 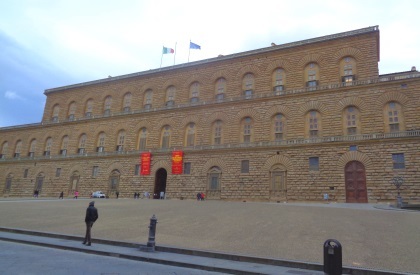 First the Medici, the rulers of the Republic of Florence, lived on the 1st floor of Palazzo Pitti. Then (around 1740) the Lorraine family moved in. When Florence was capital of Italy for some years in the 60’s of the 19th century, this part of Palazzo Pitti was even the residence of the king. Absolutely worth seeing! Highlights are for example the throne room or the beautiful white room at the entrance. But also the many other rooms are great. From all three epochs mentioned above you can see rooms, furniture and objects. There are more than 500 important pictures in the art museum, you need as a visitor of the Palazzo Pitti several hours to look at only the most important ones. Highlights in the gallery at Palazzo Pitti are, for example, three paintings by Raphael: „The Little Madonna“, „Portrait of Cardinal Inghirami“ and „Madonna della seggiola“. World-famous are also some pictures of Rubens, above all the more than 7 square meter large picture „The consequences of the war“ in the worth seeing hall of Mars, completed in 1639.. The great Renaissance painter Titian (also called Tiziano Vercellio and Titian) is also represented. You should take a closer look at his two grandiose paintings „La Bella“ and „Portrait of Pope Julius II“ (from the years 1535 and 1545 respectively)..
Also among the great works of art history in the Palazzo Pitti collection are „Assunta Panciatichi“ by Andrea del Sarto or „Madonna with Saints“ by Rosso Fiorentino (both Renaissance, early 16th century). But there are also some important recent works of art in the Palatina Gallery, such as the life-size marble sculpture „Venere italica“ from 1810 by Antonio Canova (Italian sculptor of classicism). Galleria di Arte Moderna: No less worth seeing are some works in the next museum on the 2nd floor. Estimated 25 rooms full of paintings and other works of art. An exhibition of modern art at the highest level. Although the museum is translated as „gallery of modern art“, it rather means art from the 19th century. Many visitors of the Gallery for Modern Art in Palazzo Pitti like the pictures of Giovanni Fattori from Livorno (1825 to 1908) very much. The paintings show the rural life and landscapes of western Tuscany in the 19th century. Costume Gallery: This museum, also on the 2nd floor in the right wing of Palazzo Pitti, is also said to be very interesting. Unfortunately it was closed during our visit in 2018 due to renovation. Dresses, costumes, uniforms and similar items from the 16th century are on display until today. Unfortunately the exhibition is only visited by a part of the visitor of the Pitti Palace – wrongly, the journey through 500 years of fashion is an experience. Silver Museum: In the Argentini Museum in the other, left wing of the Pitti Palace in Florence, not only works of art made of silver are exhibited. There are also many objects made of other precious materials such as ivory, precious stone and so on. We also liked the Museo degli Argenti (translated: Museum for Silver). In total you should take a few hours. The exhibition area of the museums and exhibitions in Palazzo Pitti is huge. Art lovers could easily spend a whole day alone in the Galleria Palatina. The palace is on the other side of the river Arno, seen from the city centre. Just cross the world famous bridge Ponte Vecchio and go straight on for 200 meters. It is not far away, for example from the Uffizi Art Museum, considerably less than one kilometre. The Medici rebuilt the Pitti Palace and significantly enlarged it. For almost 200 years the gigantic building remained in the possession of the family. After the end of the Medici in 1737 (there were no descendants), the new ruler of Florence took over Palazzo Pitti. It was the Austrian Emperor Franz I from the House of Lorraine. In the 19th century Florence was the capital of Italy for several years. The Palazzo Pitti was under King Victor Emanuel II around the year 1870 even for some years royal palace. Photos with flash or tripod are not allowed. There are toilets in the basement of the main building, also on the 2nd floor we found a small toilet. There is also an elevator, for example for people with disabilities or for a pram. In the courtyard there is a bookshop with literature on Florence and so on. The cash register is on the far right when you walk towards the palace. The entrance is in the middle of the palace. The palace in Florence also houses a police station, which became famous through the crime novels of the English writer Magdalen Nabb. Behind the Palazzo Pitti is the Boboli Garden with other museums such as the Porcelain Museum Florence.